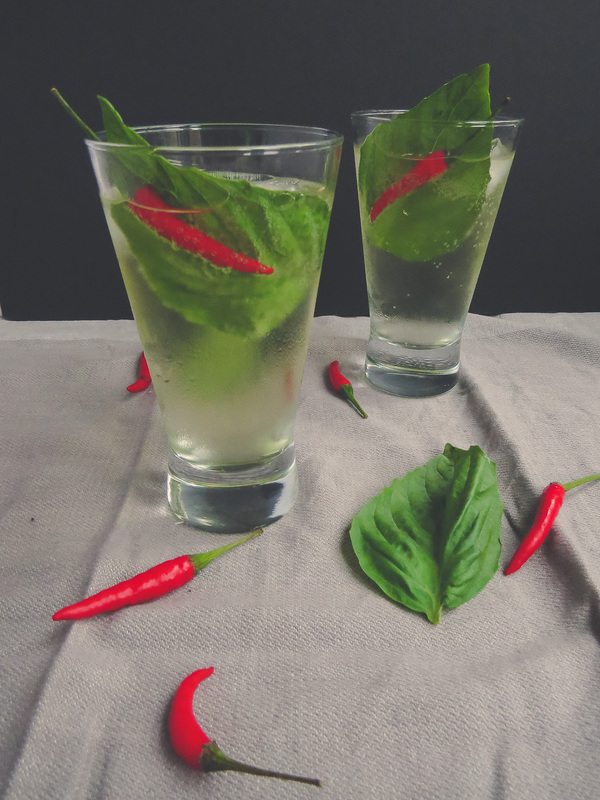 Set your tastebud rockets off with this spicy Thai Red Chilli Basil Fizz cocktail made using hot Thai red chillies, yummy basil and some gin! Experimenting with new recipes this weekend and bought WAY TOO MUCH Thai red chillies and basil. 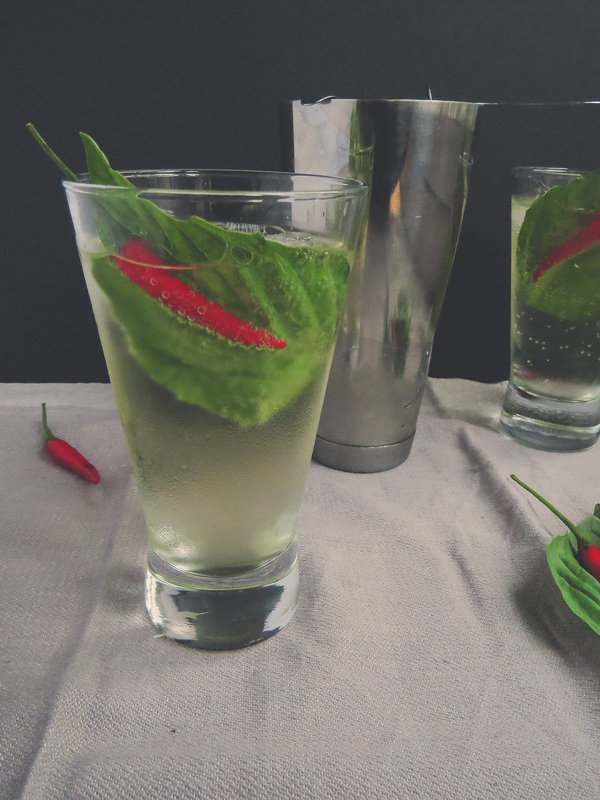 Ergo: this Thai Red Chilli Basil Fizz came to be! Yummy, refreshing and spicy, all in one sip! Originally I made this recipe for two, but it definitely can be scaled to serve as many as your shaker can hold. 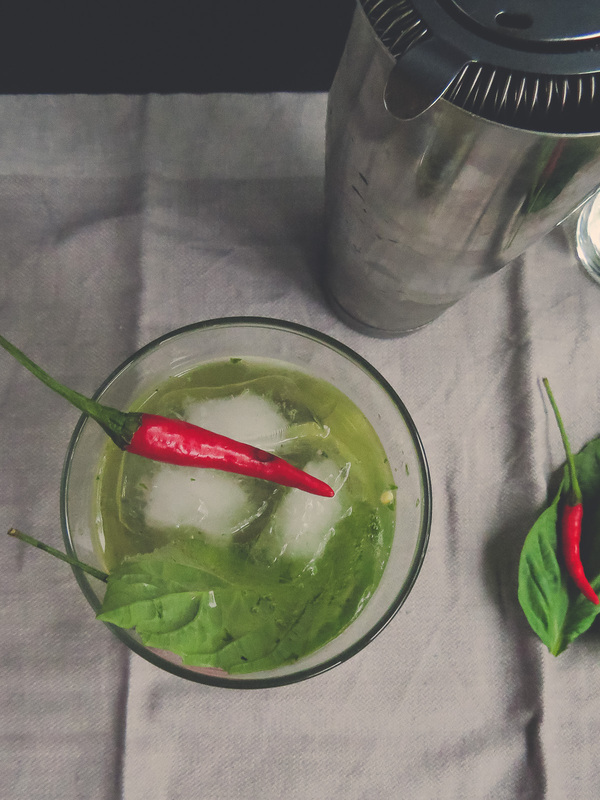 To make it: toss in two red chillies, a couple basil leaves, three ounces of gin and ice into a shaker. SHAKE IT UP. Then pour over ice in a highball glass garnishing with a chilli and a nice large basil leaf. Now imagine you did this at a get together, someone sees this yummy Thai red Chilli Basil Fizz and wants one. So you toss another ounce and a half of gin into the shaker (because you’re only making one), add some more ice and follow the same steps and serve – you think that you can recycle the chillies and basil from the first step… but you are sorely mistaken. The chillies now have undergone two rounds of shaking and are all torn apart with the seeds exposed and the drink is WAY HOTTER than the first two made. Your unknowing guest will now sip a Hot Hot Sinus Clearer instead of a Thai Red Chilli Basil Fizz! BIG OOPS! How do I know this? That third guest was my mom! So please, please, please learn from my mistakes! 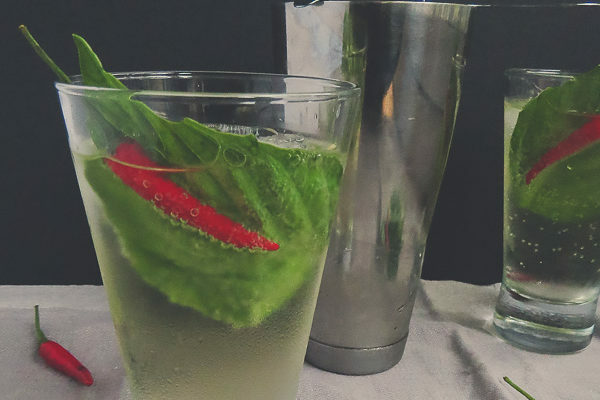 The recipe for this cocktail is certainly scalable but do not and I mean DO NOT reuse the chillies and basil for a second time – throw the old batch out, rinse out the shaker and start fresh! PS. Are the photos too moody? I’ve been experimenting with some presents and though this gave a nice little change to my usual light and bright – what do you think?! In a shaker add the chillies, basil, gin and ice. Shake until chilled, about 15 seconds. Pour flavoured gin through a strainer over ice in a highball glass. Garnish with basil and a whole chilli. Serve.